Two days after the deadly attack on the luxury Radisson Blu Hotel in Mali's capital Bamako, there is a lot we still do not know. Al-Qaeda in the Islamic Maghreb (AQIM) and its offshoot al-Murabitoun have both said they were behind it but some doubt remains. Most analysts say veteran Algerian jihadist Mokhtar Belmokhtar was involved but until now, it was thought that the al-Murabitoun leader had split from AQIM. However the alliances of the various armed groups operating in the lawless deserts of northern Mali and Niger, and southern Algeria and Libya, are constantly changing. Some of these groups have a global jihadist ideology. Some are Tuareg separatists, others make money by trafficking drugs, people and weapons across the Sahara desert, while some offer their services to the highest bidder. Some suggest that increased pressure from French special forces deployed in Mali since 2013 may have pushed Belmokhtar back into working with al-Qaeda. Adding to the confusion, the Macina Liberation Front (MLF) has now said it was behind the attack. The MLF is a relatively new Islamist group formed by ethnic Fulanis, based in central Mali. Officials say two gunmen have been killed. But while some say only two attackers entered the Radisson Blu hotel, witnesses have been quoted as saying there were up to 13. Malian officials say they are looking for "at least" three suspects, even though they have not specified whether they are believed to have taken part in the attack, or helped plan it. The attack appears to have been well-planned, with guards quoted as saying it was timed at the end of their night shift and they had put their weapons down. Media captionRescued hostage: "I heard gunshots very early in the morning"
The attackers drove a vehicle with diplomatic number plates, which is also evidence of careful preparation - and possible evidence that more than just two people would have been deployed to stage an attack on a high-profile target, which had been thought of as being fairly secure. French investigators are carrying out forensic tests on the bodies of the gunmen but so far, no information has been released. Officials say this is to avoid compromising the investigation. Witnesses described one attacker as dark-skinned and another light-skinned - usually the case with those linked to the Sahara-based jihadi groups. One security source in Mali told the BBC that the two dead gunmen had been speaking English during the attack, however their identities, or even nationalities, have not yet been established. Another source told AFP they believed the attackers were foreigners, without giving further details. Famous Guinean singer Sekouba "Bambino" Diabate, who was staying in the hotel, says he heard attackers speaking in English "with a Nigerian accent". Media captionEye-witness Michael Skapoullis: "I saw bullets on the floor"
This raises the spectre of Nigeria's Boko Haram militant group working with other West African jihadists. However, Boko Haram is part of Islamic State and so it would be a surprise if it was working with al-Qaeda linked militants, as the two groups are rivals. Was there a link to the Paris attacks? This is possible, but there is no evidence. The Paris attacks were carried out by militants linked to Islamic State. 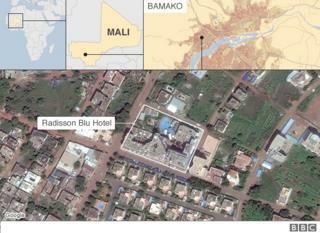 But France has some 1,000 troops based in Mali and retains extensive business links to its former colony. Some Malian jihadi leaders have threatened to attack French interests. This, however, is the third attack in Mali this year claimed by al-Murabitoun. Alongside other Islamist groups, it has been operating in the country since 2011, so the timing is likely to be a coincidence. The UN peacekeeping operation in the country has lost more personnel in recent years than any other such mission. Six Malians, including one gendarme, three hotel workers and two others. Six Russians were killed, all employees of the Volga-Dnepr airline, the Russian foreign ministry said in a statement. Volga-Dnepr reported that the six were Stanislav Dumansky and Pavel Kudryavtsev, mechanics; Vladimir Kudryashov, a flight radio operator; Konstantin Preobrazhensky, a flight engineer; Sergey Yurasov, a load manager, and Aleksandr Kononenko, a navigator. Three Chinese, Zhou Tianxiang and Wang Xuanshang and Chang Xuehui were executives from the state-owned China Railway Construction Corp, the company said in a statement on its website. Two Belgians, including Geoffrey Dieudonne, an official at the parliament in Belgium's Wallonia region. US national Anita Ashok Datar, 41, was in Mali working on projects involving family planning and HIV. Ms Datar, the mother of a seven-year-old boy, was a senior manager at Palladium Group, an international development organisation. Israeli education consultant and executive Shmuel Benalal, who is reported to have been in Mali to work with the government. Many were foreign guests staying at this luxury hotel, which was popular with business people and international air crews. Several of those killed are reported to have been shot dead while trying to escape the attackers in a lift.